6260 (3 ea) 10 Foot Copper Clad 5/8 Inch Ground Rod. The CPC.5/.75 Clamp that connects to the Actual Anchor Rod itself is included in this Kit from 3 Star. From ROHN, only when part of a Complete Tower Kit. 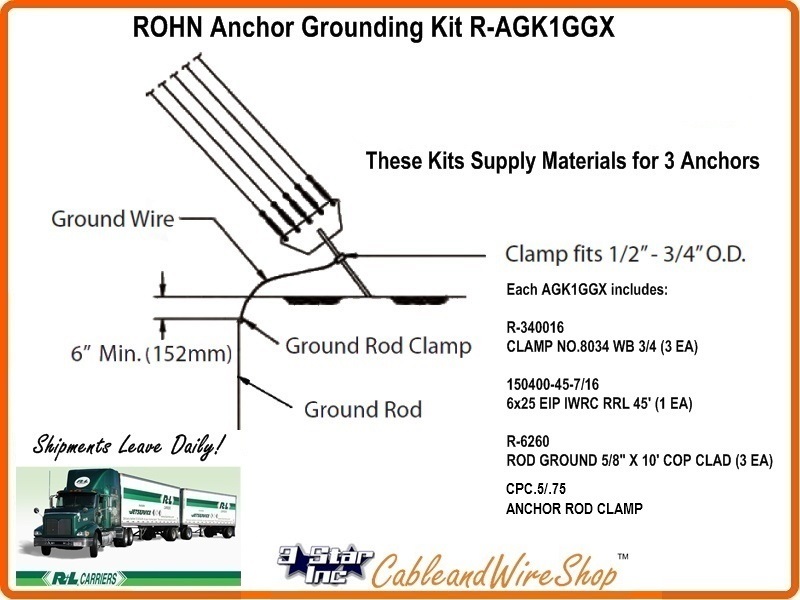 Note: This Down Guy Anchor Rod Grounding Kit is included in each ROHN 25G 45G Complete Tower Kit. When purchased from ROHN separately, this Part number omits the Clamp to the actual Anchor Rod itself, part number CPC.5/.75 (included in ours). As this contains 10 foot long items, it can only ship LTL Freight.